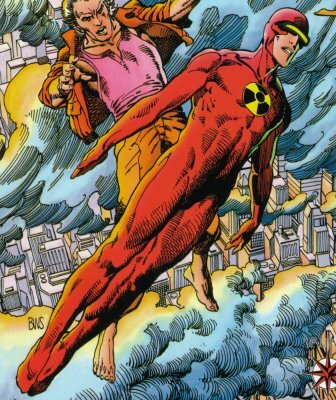 Powers/Abilities: Solar is capable of almost anything he can think of. He can fly, manipulate reality, even time travel. History: Physicist Phil Sileski had been a fan of the Gold Key comics published in the 1960's, particularly the adventures of Doctor Solar, Man of the Atom. Now an adult Dr. Sileski designed an experimental fusion reactor along with fellow physicists, Gayle Nordheim and Erica Pierce. 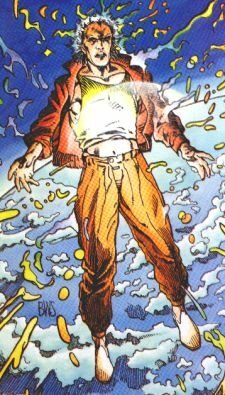 But an accident at the reactor unleashed forces that give Phil godlike energy powers - abilities subconsciously shared by Dr. Pierce. Unfortunately he lost control of these powers, killing everyone on Earth, including his beloved Gayle. The power that Phil unleashed cast him through time and space into our universe, burdened with the crushing knowledge that he had destroyed his own world. To avoid repeating his world-shattering mistakes Phil merged with the Phil Seleski of this new timeline. Adopting the guise of his childhood comic book hero, Phil defended Earth from the Spider Aliens, who called him the "Destroyer" because he was bent on their total annihilation. With her own energy powers, Erica Pierce also came to our world and drew its heroes to the Lost Land to fight in the Unity conflict. Solar ended her bid to destroy all of creation by trapping her within a miniature wormhole. Returning from the Lost Land, Phil moved with Gayle to California, where they tried to live as a normal couple. But Solar continued to be needed. Learning of a Spider Alien base on the moon's dark side, Solar teamed up with X-O to destroy the installation. Later, manipulated by Master Darque, Phil released another Solar, the Destroyer, who then journeyed through the galaxy, seeking to annihilate the Spider Alien Homeworld. Comments: For details on the original Doctor Solar, see here.